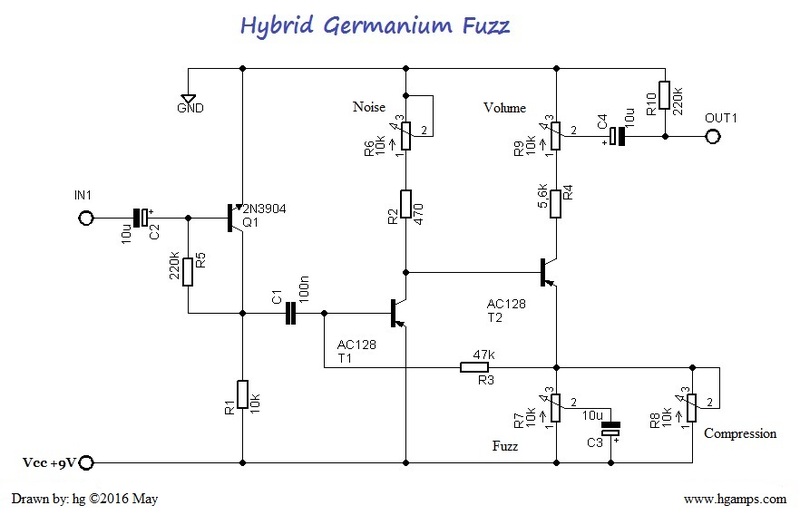 H&G Amplifiers - H&G Amplification is an manufactory that designs and manufactures music amplifiers, speaker cabinets and boutique guitar effect pedals. H&G Amplifiers - H&G Amplification is an manufactory that designs and manufactures music amplifiers, speaker cabinets and boutique guitar effect pedals. R2 is two 1 ohms in parallel. This is not marked separately in the drawing. 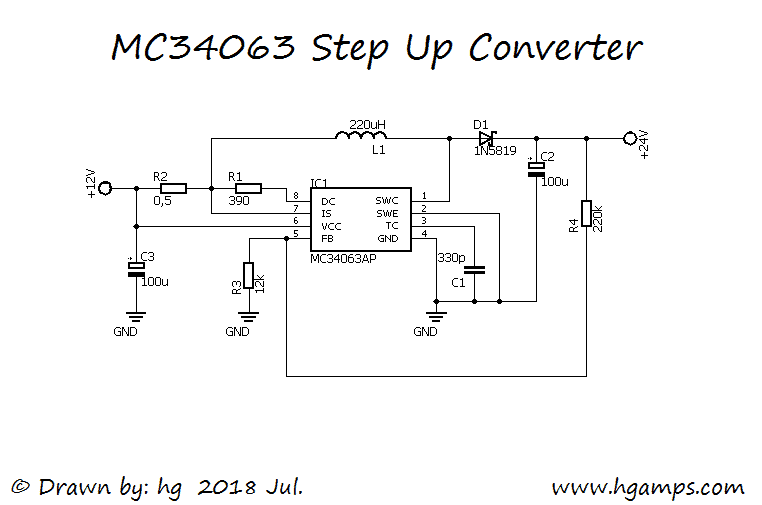 Here is the official MC34063 datasheet, which is worth studying. Some pictures: electronics repair. 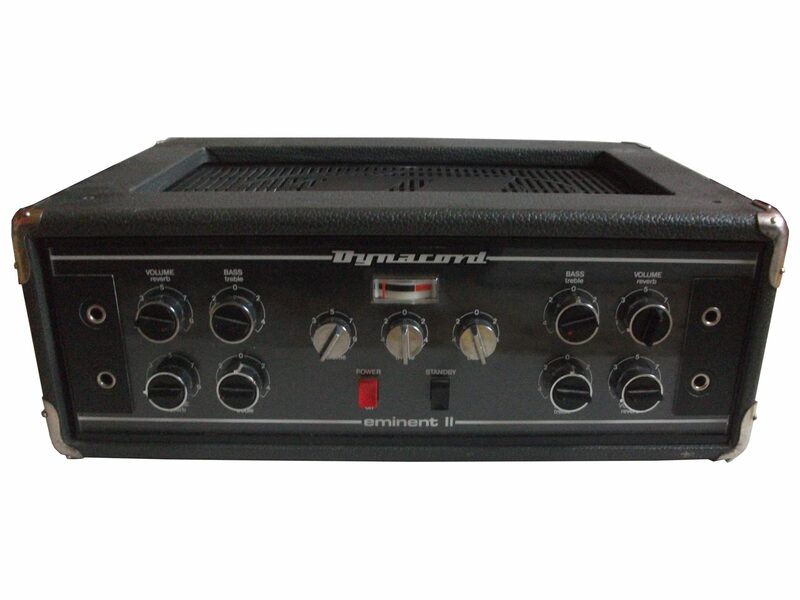 The product name: Dynacord Eminent II. This is beginning to be manufactured in the mid sixties. Initially, all tube design, and later the transistor preamp and tone section. Meanwhile, little change in design as well. This four different input and tone control. A small band certainly met at that time.Well, let’s look at what is inside. So far, we do not really dealt with bass guitar effects, amplifiers. Here, in this time of change! 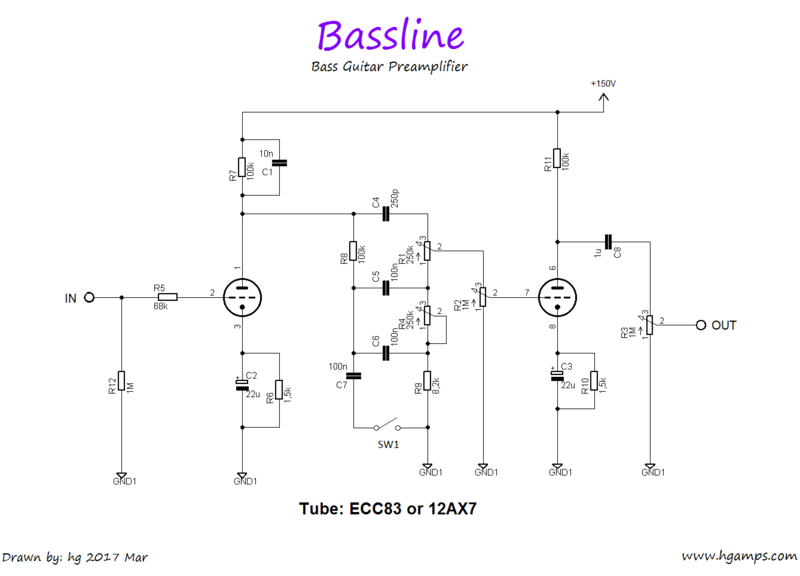 One of my favorite band The Beatles, inspired a new tube bass preamp creation. tone you want to give a little back. This simple, little preamplifier may be able to create a good bass sound. Okay, what do we need? First, a simple tube preamp and a tone sections. And yet… put a little extra! Whether it is a switch which can give more prominence to the bass sound. And finally result in the power amp section. The tube 12AX7 or ECC83 should be. And we are ready to go. 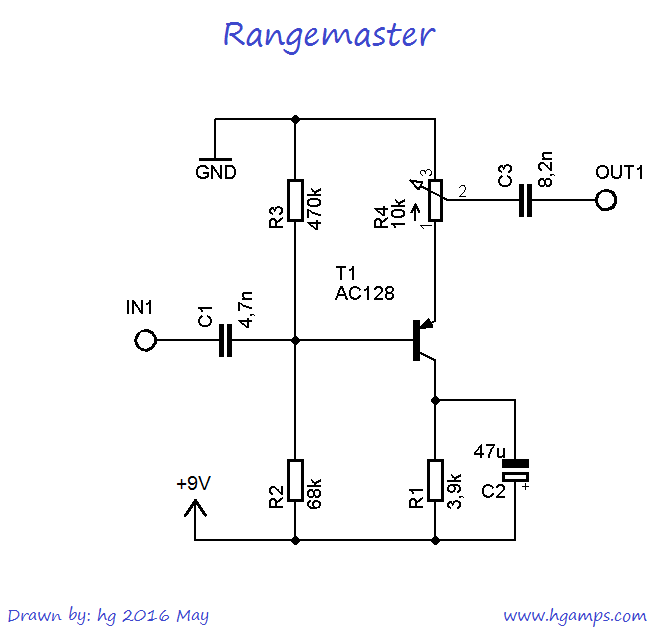 As shown in a schematic diagram, not complicated circuit. The circuits are designed triodes ordinary way. Located between the two triode the tone control section. Here we must mention the little extras are what we promise you. It was built in the SW1 signal switch and capacitor C7. This will give even more powerful bass sound. Even a small change in the circuit (well, not so little, the C8 is quite large capacitor). The C8 was originally 100nF, it was replaced with 1uF. Thus, it improved bass response with what is perceptible difference. Suggested type for a high-quality MKP capacitor. We conducted a little experiment, was left inside the 100nf and 1uf capacitor, one switch to choose between the two, and thus is connected to the output. so you can compare the two capacitor deep voice transmission. Feel free to experiment with different manufacturers and types of capacitors. We have a piece of the American history from the electronics computing age. 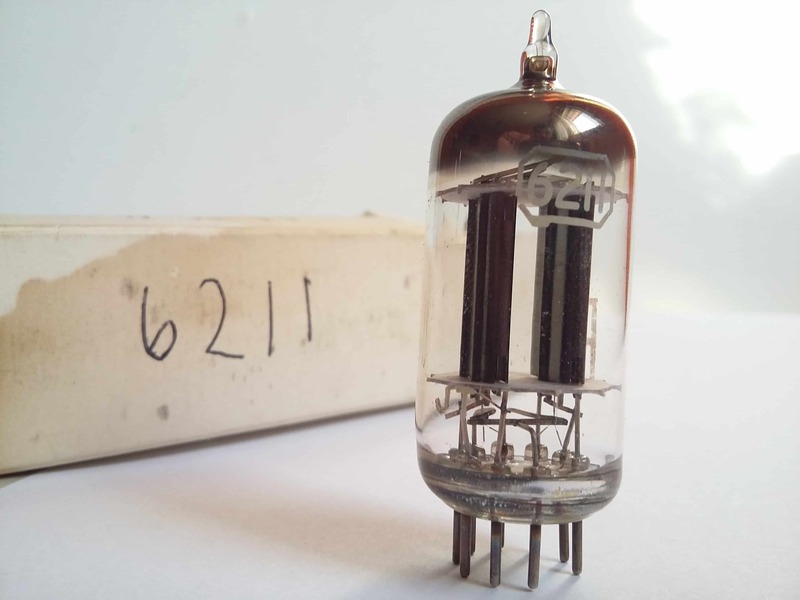 It’s not other than RCA Corporation (Radio Corporation of America) 6211 type electron-tube. Aural Exciter since the 70’s. Do you know that feeling when you’re playing on guitar however you’re missing something? You’ve got many effect like distortion, overdrive, delay or something programed effect. You’re sure something is missing from your music and it’s not other than fatty and lively sounding. Fortunately there is a solution for this. It’s a very interesting device. It’s Aural Exciter or “harmonic enrichment”. This circuit adds harmonics sounds for the incoming signal. Aphex Electronics company made the first device in the 70’s. Initially it was made with vacuum tubes later with transistor. Nowadays you can get it as a software. 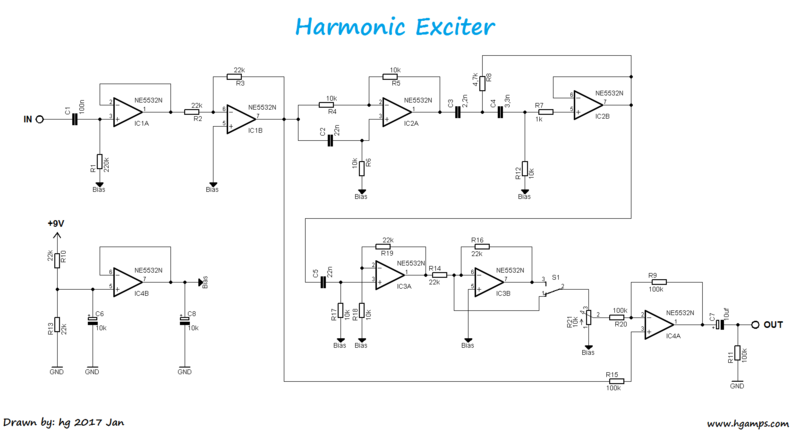 How does Aural Exciter work? The incoming frequency multiplied by circuit. Well, if the incoming frequency signal is 2 kHZ than the circuit generate it to 4, 6, 8, 10, 12, 14, 16 kHZ frequency. 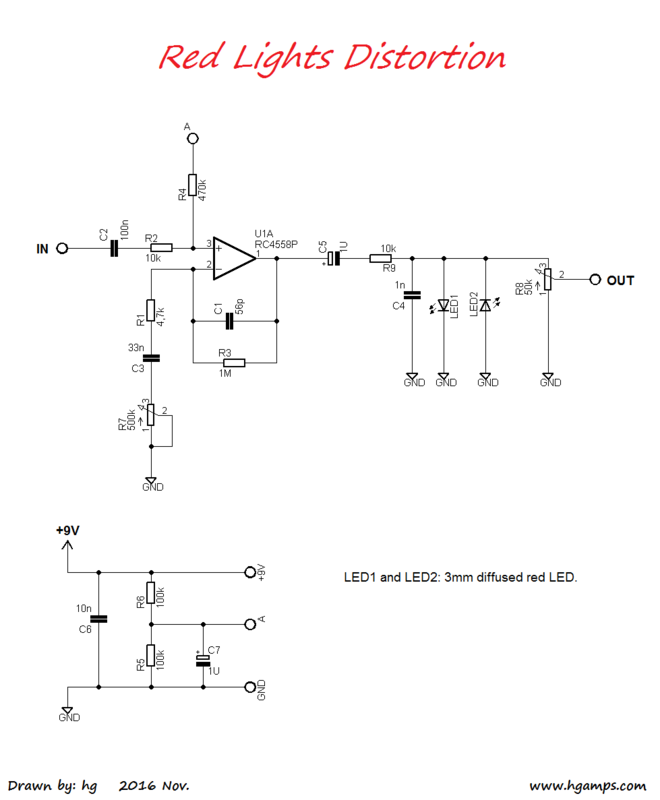 Red Lights – RC4558 op amp based distrortion. Well, again, we present a very simple circuit. As is also shown in the drawing, few parts. The circuit is based on a dual operational amplifier RC4558. But this is only half used, so there is only one using the op amp. Alternatively, you create an active tone control in the second operational amplifier section. The legendary Rangemaster effect. At the time, that is the end of the ’60s, the amplifiers are not prepared to distortion. I prefer to have a nice voice, faithfully reproduce the sound of the guitar. Of course, it was possible to overdrive when the guitar was full volume. If an external device, the sound midrange has been highlighted, they were given a musically useful sounds. At that same time, more “mid boost” existed. Among the most famous of all, to this day the “Dallas Rangemaster”. 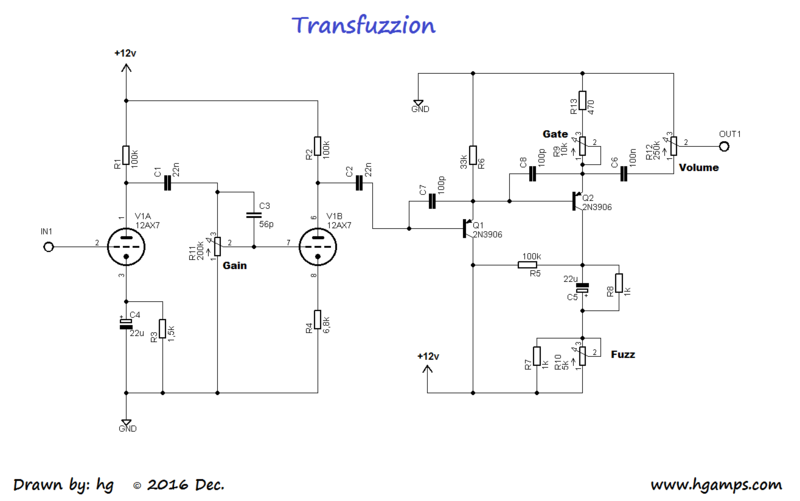 This is a very simple circuit using germanium transistor. The original device uses a OC44 transistor. 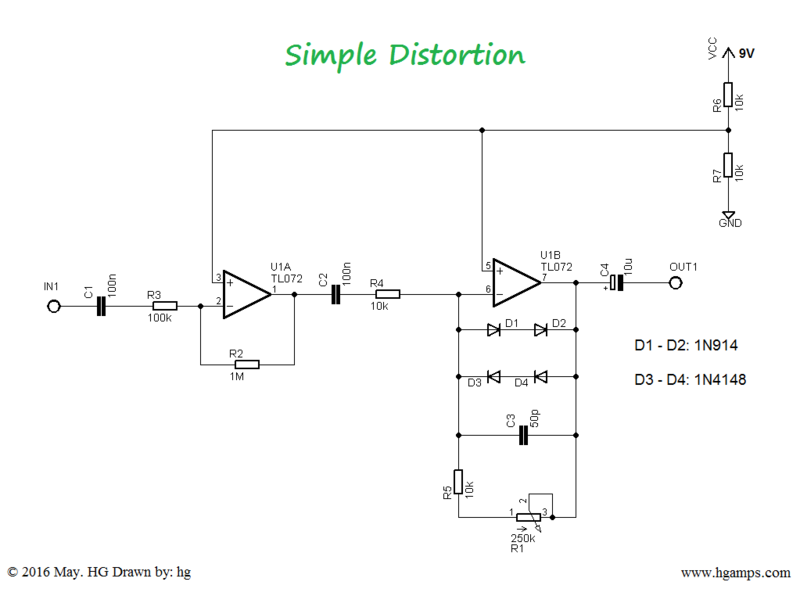 The simple distortion efect circuit.